Na domačo stranPoročanje v živoSeznam poker turnejWSOP2012 World Series of PokerEvent 32: $10,000 H.O.R.S.E. Congratulations to David "Bakes" Baker, Winner of Event 32: $10,000 H.O.R.S.E. ($451,779)! 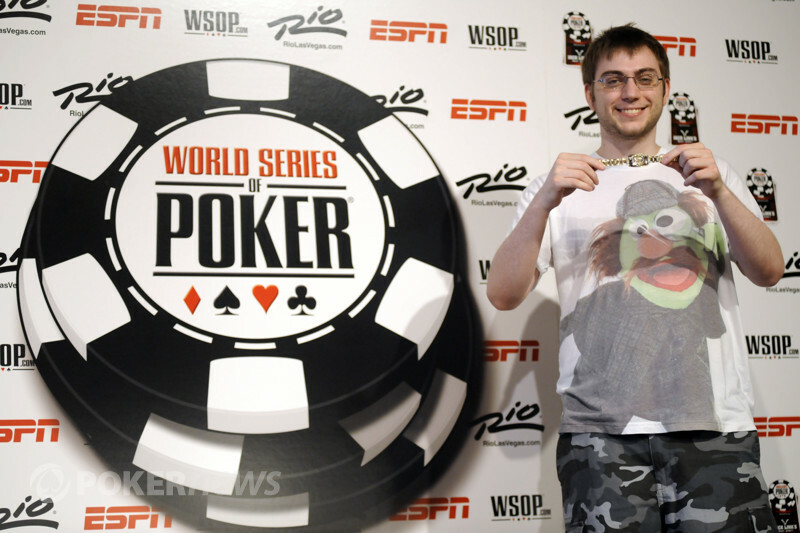 Before today it was hard to argue that this hasn’t already been one of the most exciting years the World Series of Poker has seen in a long time. Today just made it all that more exciting as a massive finish to Event 31: $10,000 H.O.R.S.E has seen David "Bakes" Baker crowned the champion, overcoming John Monnete heads up and defeating a final eight that included Phil Ivey and Phil Hellmuth. It all started three days ago when 178 players signed-up for their chance to become the champion of H.O.R.S.E. By the end of the first day only 136 survived and when Day 2 was all over, just 15 of those were still in contention. That brings us to today. John Monnette was the player who started the final day with the chip lead and he managed to make it all the way to the final eight. Some of the players who fell by the wayside during that period were David Bach (14th), John Hennigan (12th) and Scott Clements (12th). Mori Eskandani was at the “unofficial” final table, but bubbled the official final table when he was eliminated in 9th place. Here is how the final eight stacked up. As you can see, it was Monnette who took his lead from the start of the day straight into the final table, while Ivey was not far behind. Amazingly this was Ivey’s fourth final table in just over a week and he would be looking to turn it into his first gold bracelet of 2012. The first player to hit the rail at the final table was Dan Kelly. The last hand of Kelly’s tournament was during a hand of Stud Eight-or-Better and it ended up being Hellmuth who dealt the fatal blow. Next out the door was Matt Waxman in 7th place, followed closely by Abe Mosseri in 6th. Mosseri was short-stacked during an Omaha Eight-or-Better orbit and ended up being all-in preflop holding against David "Bakes" Baker’s . The board brought Mosseri no help and he was sent packing. At this point both Ivey and Hellmuth were still in contention to make poker history, but unfortunately they would be eliminated back-to-back. First to go was Ivey, with his elimination occurring during a hand of Razz against Monnette. By the time all the cards were dealt out, here is how they looked. Ivey never flipped over his final downcard as he was sent home in 5th place and will have to find his first gold bracelet of the summer in another event. After Ivey’s elimination, it didn’t take long for Hellmuth to be the short-stacked player. A roller coaster ride of a level saw Hellmuth all-in multiple times, but it wasn’t until a hand of Omaha Eight-or-Better that Hellmuth would actually be eliminated. 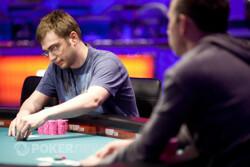 Monnette would be the player who dealt the final blow to Hellmuth, with his being too strong for Hellmuth’s on a board. With Hellmuth out in 4th place, Monnette had eliminated both “Phils” and we would take to three-handed play. Never one to shy away from the action, Monnette would end up busting the third-place finisher during a hand of hold’em. Monnette’s outdrew the of Paul Sokoloff, sending him home in 3rd place. Despite eliminating three players in a row, Monnette still only held a slight chip lead going into heads-up play against Baker. By the time it was over, either Monnette was going to have his second gold bracelet of the summer after taking down the victory in Event 10: $5,000 Seven Card Stud, or Baker would have his second career bracelet after winning the $10,000 2-7 Draw Lowball event in 2010. It took just over 90 minutes for the deed to be done in the end, with Baker eventually managing to overcome Monnette, details of which can be seen below. After this effort, Monnette now has a 1st, 2nd and 3rd place finish during this year’s WSOP and now sits atop the Player of the Year board. Our congratulations must go out to David "Bakes" Baker for his $451,779 score and of course, for taking down his second WSOP gold bracelet. That’s all from us tonight, but make sure to return to PokerNews soon and don’t miss one minute of action from the 2012 World Series of Poker. John Monnette - 2nd Place. Monnette brought it in, Baker completed, and Monnette called. Baker led out on fourth and fifth street, and Monnette called both bets. Monnette made a better board on sixth, and check-called bets on both sixth and seventh. Baker turned over for jacks and nines, and Monnette mucked his hand, leaving just 150,000 chips in front of him. Baker's three up-cards were , Monnette's were , and Baker flipped over a third seven - the - on seventh street. We never even caught Monnette's seventh card, because he quickly mucked, shook Baker's hand, and left. 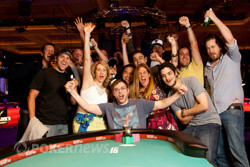 Monnette now has a first, a second, and a third at the 2012 WSOP, making him the leader in the Player of the Year race. He also takes home $279,206 for his efforts. David Bakes Baker now holds a more than 4-1 chip lead and most of those chips came courtesy of a Stud hand. This is how the player's hands looked. Monnette was the bring-in with the deuce and Baker completed with his ten. Monnette then raised it up and Baker called. On fourth street, Monnette bet and Baker called. Fifth and sixth street would see Baker lead and Monnette call and then we were on seventh. The final card saw Baker bet and Monnette raise. Baker then made it another bet to go and Monnette begrudgingly called. When Baker snapped over his , it was good enough to make him the straight and good enough to send Monnette's cards into the muck. Baker brought it in, Monnette completed, and Baker called. Monnette check-called bets on fourth and fifth street, and when he made a better board on sixth, Baker bet. Monnette called. Baker led once more on seventh, and Monnette again called. Baker tabled for a seventy-six, and Monnette mucked. 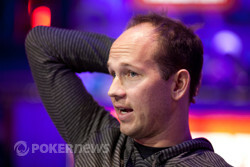 John Monnette has edged ahead of David Baker during a hand of Omaha Eight-or-Better. It all started when Monnette flat-called on the button. Baker then made it three-bets to go and Monnette called. On the flop, Baker lead and Monnette called. A on the turn would see Baker again lead and Monnette call as the completed the board on the river. Baker opted to check here and then folded his hand when Monnette fired up a bet. The match is even again. David "Bakes" Baker had the button, and raised. John Monnette defended, and the flop fell . Monnette check-raised, and Baker called. The turn was the , and Monnette led out. Baker called. The completed the board, and Monnette led once more. Baker called. "Fours," Monnette announced, tabling . Baker mucked, and Monnette raked in the pot. David Baker took down one of the first hands back from the break and edged even further ahead, but John Monnette managed to win those chips straight back during a hand of Limit Hold'em. The hand started with Monnette opening the button. Baker then three-bet in the big blind and Monnette called. The flop would see Baker lead and Monnette call. Baker then check-called a bet on the turn. Baker again check-called on the river and Monnette tabled his , enough to send Baker's cards into the muck and plenty of chips into Monnette's stack. The players are back from the break and ready to keep playing.